This part of the coast has frequent power outages, yesterday while we were in San Jacinto the power went out around noon and never came back on until after 6:30 last evening. Sometimes it can be as little as 15 minutes or go on for the entire day or night. Joe and I have discussed purchasing a generator to power our refrigerator and the water pump when this occurs – which is pretty often – but we are not up to that on our wish list for the house yet. 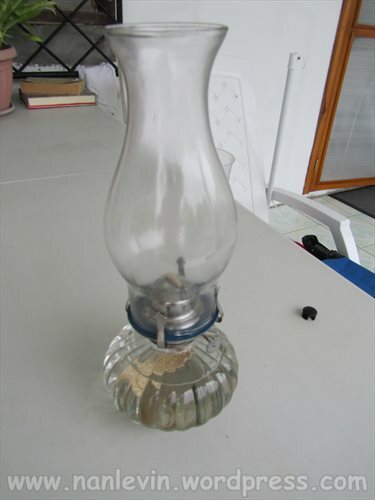 A few days ago we did check off one smaller item – a little kerosene lamp. We were in Portoviejo shopping for our monthly supplies and saw this little lamp. Well they actually are not using kerosene any longer this is fueled by paraffin oil and the label states that it is sootless, smokeless and odorless. We could have purchased citronella oil but I can’t stand the smell and don’t think it makes one bit of difference in chasing mosquitoes away. I did find my Palo Santo bowl as well. While returning from Portoviejo I had our driver stop at a road side stand and I got this beauty for $2.50. I like the smell of Palo Santo and I do think it is a good mosquito repellent. Note after the posting of this article: Palo Santo is a dried wood that is used by the locals to repel mosquitoes, our first exposure to it was an artisan store in Puerto Lopez, each evening as we would walk back from dinner we would smell this lovely almost sweet aroma in the air, this is Palo Santo. In my one post on “Building a Finca” Dec. 1, 2012 there is a photo of a Palo Santo tree from our friends Ivan and Max’s finca here in San Clemente. I understand that the wood needs to be dried for two years prior to being used as a mosquito repellent. What more could we ask for – light when the power is out and a sweet-smelling mosquito repellent – we are ready for a quiet evening on our porch. 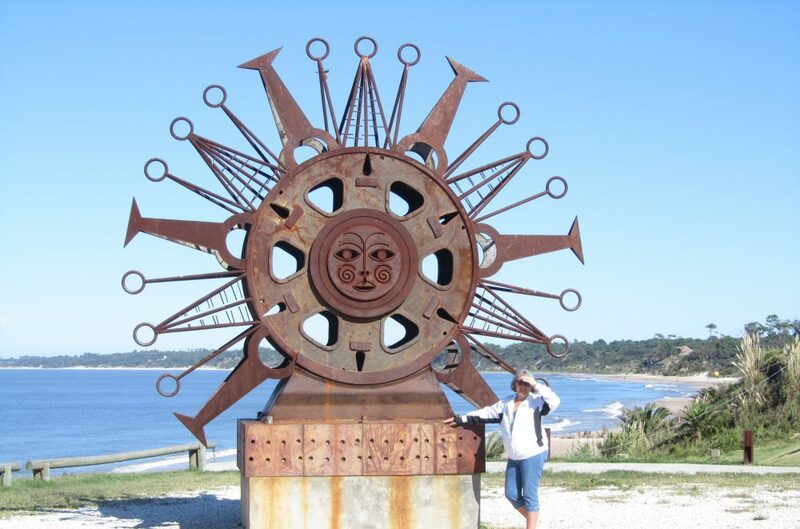 This entry was posted in Beach, Bugs, Dengue, Ecuador, Manabi, Mosquitoes, Palo Santo, San Clemente and tagged Beach living, Ecuador, Expats, Kerosene lamp, Palo Santo, Portoviejo, Retired, San Clemente, South American by Nancy Levin. Bookmark the permalink. 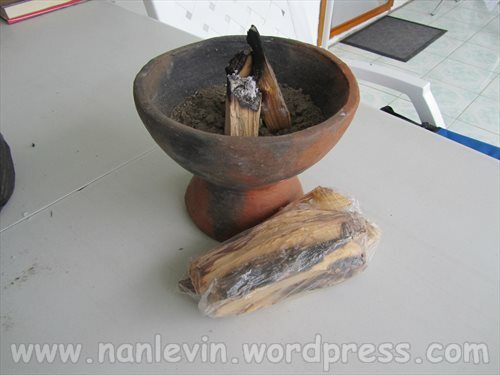 What is Palo Santo – the bowl? What is in the bowl burning? How romantic. I’m so jealous.